The Laser Genesis uses a non-invasive laser to safely and effectively treat fine lines, large pores, uneven skin texture, scars and can also be used to diffuse excessive redness, i.e. rosacea or rosy cheeks. Excessive redness is caused by dilated capillaries which result in the blood vessels becoming well defined. The most commonly affected areas are the nose, forehead and cheeks. The most common areas to be treated are the face and neck. 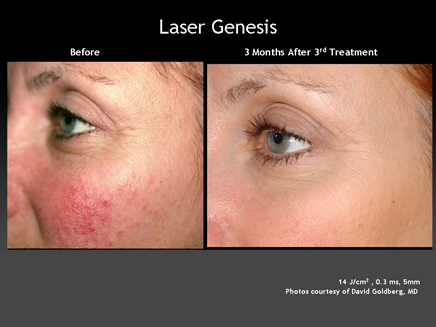 The Laser Genesis can also be used on recent scars on other parts of the body. During the procedure, you will feel a gentle warmth of your skin's surface due to the laser being moved back and forth about 0.5 inch above your skin. There is no downtime - you can resume normal activities after your treatment but ensure that you use a SPF 50 sunscreen if you are undertaking outdoor activities. The Laser Genesis works by gently heating the upper dermis well below your skin's surface and thereby stimulating collagen regrowth. To reduce redness, additional heat is generated in the dilated capillaries. 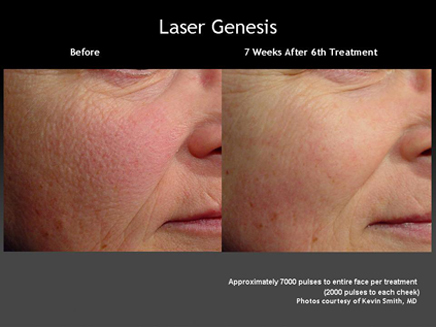 The Laser Genesis can help to restore your skin's youthful glow and appearance by smoothing out uneven textures caused by aging, sun damage or scars. Your complexion will become more healthy and look more creamy as large pores are reduced in size and minor imperfections are reduced. Before treatment, you will not need to use a topical anaesthetic or gel. You must remove your make up before treatment. There are very few side effects to the treatment. The most common is a slight redness that will disappear after a few hours of completing the treatment. There is no bruising or excessive skin irritation after each skin treatment. You can expect to see subtle results after each treatment. This treatment is unique and shown to be virtually painless. It benefits from a course of treatment as a single treatment is not effective. To receive the best results, you may need between four and six treatments but every patient is different. The overall effect of multiple treatments can be quite impressive. For any other concerns or queries you may have about laser genesis skin therapy, please visit our contact page to get in touch with us.